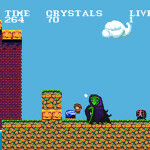 Debuting on the PC and Xbox Live Indie Games—at only $1.00!—AdamTheOtaku has succeeded in adding his retro 2D platformer, Blue Beacon to the blossoming list of video games developed by Oklahomans. 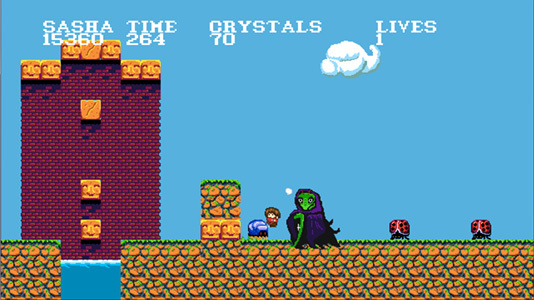 In Blue Beacon, players take control of Sasha in a quest across three worlds, each with four stages, to collect three ‘Discs of Power.’ From the moment you begin the first stage you’re treated to an immediate homage of the beginning 1-1 stage to the original Super Mario Bros.—no doubt telling you what sort of game Blue Beacon will be. Continue further in the game and you’re treated to allusions of other early console platformers such as Kid Icarus, Kid Chameleon, Adventure Island, Bonk, and so on. Yet adding its own personality, Sasha collects diamonds instead of coins (with 100 granting an extra life) while enemies like Goombas and Koopas are replaced by ladybugs and pillbugs. Meanwhile each of the three worlds possesses an insect themed power-up headgear to aid Sasha in better traversing them, such as the beetle helmet to crash through obstacles, the butterfly helmet to glide short distances across terrain, and the grasshopper helmet to super jump up and over both. But perhaps Blue Beacon’s bigger personality is its controls. Its very slippery controls. A risky yet intentional design choice on the creator’s part, Sasha never comes to a complete halt but will always continue for a few more steps after you release the controls. As such, with only four lives (include the zero), no continues, and no checkpoints, Sasha will frequently be visited by a praying mantis grim reaper swiftly swooping in after each death. And the majority of a player’s deaths will likely be caused by the controls causing them to smack into enemies, mis-jump, or slide off ledges no matter how cautious or haphazard their play style is. Though one can appreciate the game’s old school personality, its intended old school difficulty feels misguided with the challenge coming from the player fighting the game’s controls more than its designed environments or mechanics. Meanwhile the level designs themselves are basic while carrying a reminiscent tone to early platformers, but at the same time lack a strong personality fitting to its insect theme. And despite the 300-second timer to outrun, the stages are also rather short that players can freely meander about the stage or preoccupy themselves elsewhere for a few minutes and still have time to spare afterwards without having to speedrun to the finish. At times it may even feel that the stages end abruptly with no sense of transition to signal that one is nearing the end other than the screen no longer scrolling. 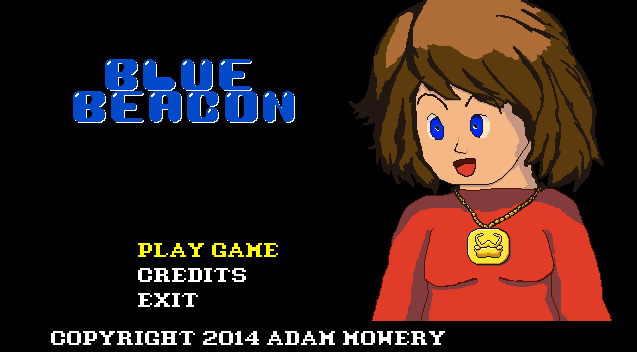 The sparse selection of music in Blue Beacon still contains rather fun, hum inducing tracks fitting into the retro platform vibe, at times vaguely reminiscent to the tracks of other early platformers even, without needing to fully emulate the sound of chiptune music. And though none of the tracks stick as memorable or match the game’s theme, the music’s somewhat smooth jazzy tone delivers a calm, breezy attitude despite the gameplay. Optimally the game can be completed inside a half-hour yet the limited lives, lack of continues and the games own controls will prolong that time table should one decide to see the game through rather than turn away in annoyance. And though not an intended clone of its platforming predecessors, Blue Beacon lacks any strong and lasting personality, or further development of its insect theme, or even noteworthy platforming features to differentiate itself from being considered a clone at worst and generic platformer at best.